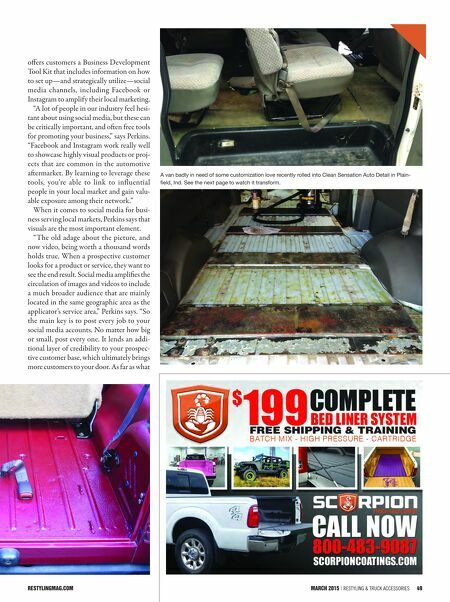 48 Restyling & tRuck AccessoRies | March 2015 restylingmag.com John Perkins, Scorpion's art director, says that shops might be surprised at the level manufacturers will go to help their cus- tomers grow their business. "We and other manufacturers, regardless of the product line, don't want to be simply pushing products," Perkins says. "Any manu- facturer in any market will do their best to provide great products, but it's all the other support systems that restylers should look into and take advantage of." Graphic Design and Printing Services Perkins offers a few examples of the mar- keting support manufacturers like Scorpion provide. While many manufacturers provide bro- chures and printed materials to support product sales, some manufacturers go fur- ther, providing everything from window clings to floor graphics, pop-ups, display boards and a range of support literature. ese tools help drive awareness, and ulti- mately sales, at the point of sale and at spe- cial events, and if the manufacturer provides them at no cost, so much the better. Also, if you have a wide-format printer for vehicle wraps, ask the manufacturer to supply mar- keting images you can use to print your own point of sale and special event graphics. 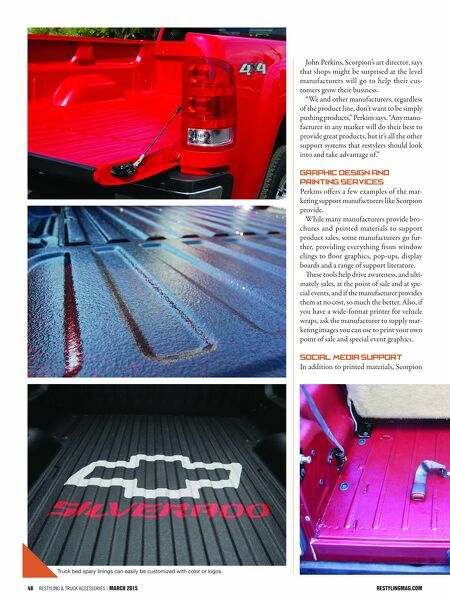 Social Media Support In addition to printed materials, Scorpion Truck bed spary linings can easily be customized with color or logos.